In this column, Joe Dowdell, CSCS, of Peak Performance Gym in New York City, tackles your questions. How should you properly warm up for your workout? I keep hearing that I shouldn't do old-school stretches before hitting the weights, but that I shouldn't just start lifting cold, either. What the heck should I do? Put the nervous system on alert: working coming! Pick anywhere from three to six movements for your dynamic warm-up. Particularly if you're new to training or shaking off some rust, this warm-up probably will feel like part of your workout. It'll actually fatigue your muscles. No worries: over time, this effect will diminish and then vanish, and your warm-up will feel like, well, a warm-up. 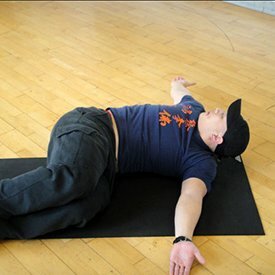 Do this: Lie on your right side with your hips and knees bent at a 90-degree angle. 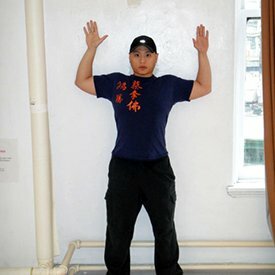 Extend your arms directly in front of you at shoulder level, palms together. [see Photo 1] While keeping your right arm and lower body in the same position, slowly rotate your left arm and torso leftward, until your left hand touches the floor (or as close as you can come.) [see Photo 2] Hold for 2 seconds. Return your right arm to the start position. Repeat for the prescribed number of reps, then roll over and do the same number of reps on the other side. If you can't touch the floor at first, try to get closer with each repetition. But make sure to maintain correct body position throughout the movement. Lie on your side with your legs straight, left on top of right. Place your right arm under your head and your left arm in front of your body in order to brace yourself. Your body should form a straight line from head to ankle. [see Photo 3]. Keeping both legs straight, raise your left leg as high as you can while keeping your body in a straight line. [see Photo 4]. Pause momentarily. Return to the start position. Repeat for the prescribed number of repetitions. Switch sides and repeat. Place a towel or pad under your left knee. Your right leg should be directly in front of your body, knee bent to 90 degrees, foot flat on the floor. While keeping your chest up and torso vertical, gently brace your core and tighten your left glute. Slowly drive your hips forward until you feel a mild stretch in the front of your left hip. Continue to tighten that left glute. Hold for 2 seconds [see Photo 5] and then return to the starting position. Make sure you keep your core tight and the glute contracted for a nice stretch. Don't extend with your lower back, and try to go a little farther with each repetition. Perform the prescribed number of reps on the right side. Switch sides and repeat. 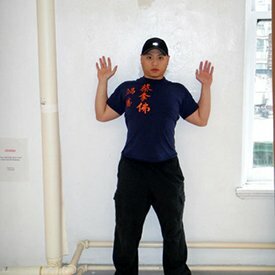 If any of these body parts lose contact with the wall during the movement, stop! Lower your arms back to the bottom position, and only go back up to that point for the remainder of your reps.